New Delhi : Despite the Samajwadi Party leaders denying about the rift within the Yadav family, the confession of senior leader Ram Gopal Yadav clearly shows that Amar Singh who was brought back in the party by Shivpal Yadav is the center of the whole scene while Akhilesh has always seen Singh as an outsider. 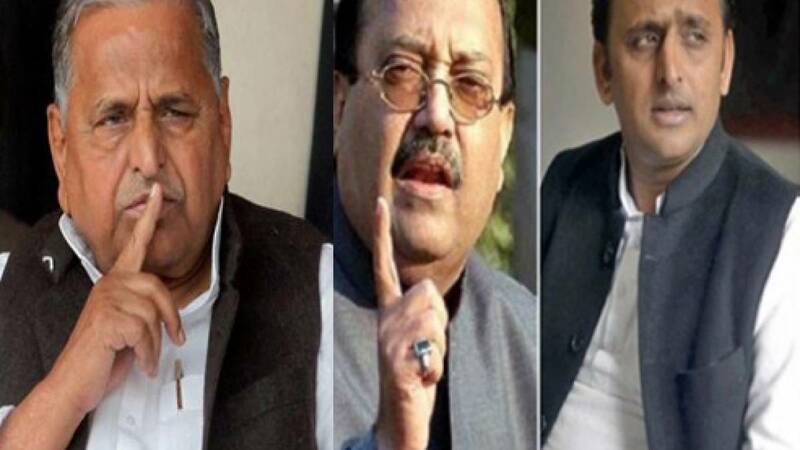 Amar Singh had on Wednesday denied being involved in a spat with Akhilesh but after Ram Gopal's confessing it is cleared that Amar is surely the reason for the civil war in the party. Akhilesh had on Wednesday said, "outsiders" were interfering in the affairs of the family and the party. Addressing mediapersons, Ram Gopal Yadav said, "Had Akhilesh been asked to resign from UP president's post would have been better." The senior leader further hinted out that compromise formula is working out and there are possibilities that no parliamentary board meeting could be called for now as Shivpal could likely get back his portfolios. Seen in a damage control mode, Akhilesh’s close aide, Ram Gopal further said," The decision of removing Akhilesh from post of SP chief has affected the CM's image as Akhilesh is the face of the Samajwadi Party and this is not good for the party’s image." It may be mentioned here that after Shivpal Yadav was stripped of from four key portfolios by Akhilesh Yadav, following Shivpal flew to Delhi and had a 5 hour long meet with the party chief Mulayam Singh Yadav, which went in vain as denied to work under CM Akhilesh Yadav. The SP chief had called for a meeting on Friday to solve the differences between Shivpal and Akhilesh. Besides, Ram Gopal Yadav who is believed to be close to UP CM has been asked to talk to Akhilesh. #As per sources constitution could be changed to accommodate Akhilesh in organisational structure and He could also be made National working president. # I am still in the Akhilesh Cabinet. I will do whatever Netaji (Mulayam Singh Yadav) will ask me to do, Shivpal Yadav had said on Wednesday. # While Akhilesh was also quoted saying that his is a tussle in the government, not the family. generally go by what Netaji tells me but, yes, I do take some decisions on my own. # Meanwhile, Akhilesh in an indirect reference to Rajya Sabha member Amar Singh, who was recently taken back to the party, said there were some outsiders who were trying to influence the government decisions. # While Amar Singh denied that he was the outsider, Akhilesh Yadav was referring to. # Earlier Mulayam removed Akhilesh from the post of the SP party's state chief and named Shivpal in his place. In retaliation, Akhilesh stripped Shivpal of 4 key ministries.